The idea of a network of superhighways was discussed long before the Interstate System came about. Often, the vision was of a single straight-as-an-arrow toll transcontinental superhighway, or a network of such highways, and wide right-of-ways that could be rented or sold to combine with toll revenue to pay the bills. Right-of-way would also be made available, for rental, to other modes of transportation, particularly railroads. The vision always involved toll superhighways because, in the view of the visionaries, the toll revenue would ensure that the plan would pay for itself without Federal or State tax revenue. Their calculations always proved it. On October 2, 1936, President Franklin D. Roosevelt visited New York City for groundbreaking ceremonies for the Queens Midtown Tunnel under the East River linking Manhattan with Queens. 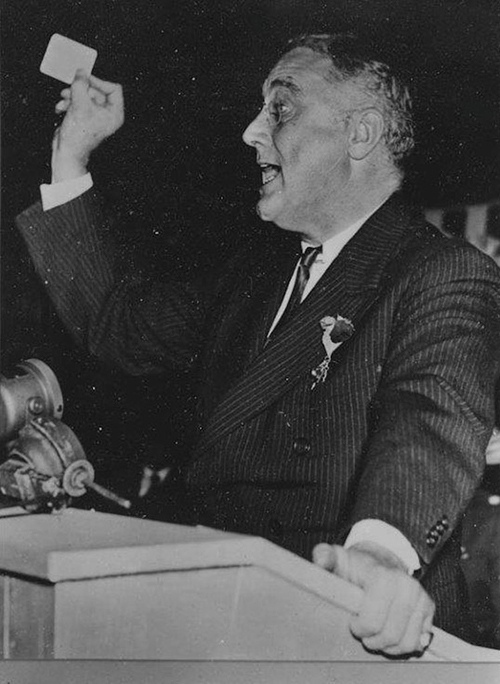 Addressing a crowd of about 25,000, Mayor Fiorello H. La Gaurdia concluded his speech by handing President Roosevelt a membership card in Local 184 of the International Brotherhood of Engineers and Shovel Runners. The President concluded his speech by congratulating residents "on what is going to happen in about a minute and a half when, as a member of the Union, I press the button which will put the shovel in operation." Union card in hand, he shouted "Let her go!" and pressed the button, prompting a new clam-shell bucket to dig and dump the first load of dirt in a waiting truck. The Midtown Tunnel, as it is commonly called, opened on November 15, 1940. I went over to the White House this afternoon at two-thirty to a conference called by the President on the proposed transcontinental highway . . . . At intervals during the last year I have suggested the possibility of such a highway to the President. He has always been rather taken with the idea, but it has now really struck his imagination and he is giving very serious thought to it. Recently at one of our conferences to consider a program of public works for next year, the President outlined a route for a transcontinental highway from east to west and routes for two or three north and south highways. The meeting today was to consider these routes as outlined on a map of the United States and to consider costs, etc. Nothing came of the idea, but in the next few years, visionaries and several members of Congress introduced variations on the theme. Senator Robert J. Bulkley (D-Oh.) introduced one of the most prominent plans in 1938. 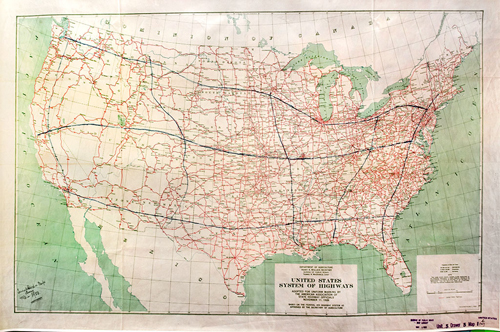 He proposed creation of a United States Highway Corporation that would build three transcontinental and seven north-south toll superhighways, linked by spurs and connectors. The key feature was that the cost would be self-liquidating through the usual combination of toll revenue and sale or rental of excess land in the 600-foot wide right-of-way. The President was reported to have told the Senator that he had been thinking of a similar plan for some time, and to have told him to draft a bill. This the Senator from Ohio is now doing with the help of engineering and financial experts. The Times added that the President's encouragement of Senator Bulkley's plan gave "special significance" to the superhighway talk. Senator Bulkley was confident, "after discussing the proposal with Federal highway officials," that details of financing could be worked out for the express highways "guaranteeing the government against loss, assuring investors a fair return, and at the same time providing a ‘fill-in' program of road building during curtailment of regular Federal highway aid appropriations." The President would mention the Bulkley plan several times in the next few days during meetings, and it would remain in the news. However, Congress did not approve the plan and in November, Bulkley lost his reelection bid. 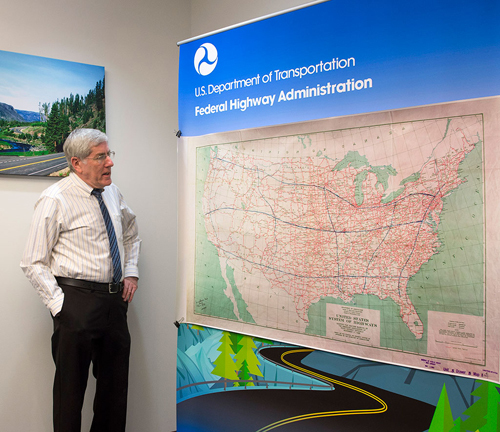 Richard F. Weingroff, FHWA's historian, recently displayed a full-size copy of the Roosevelt Map that launched the Interstate System. New York City and Seattle. Washington, D.C., and San Francisco. Savannah, Georgia, and Los Angeles. Boston and a point in north central Florida corresponding with Lake City. Great Falls, Montana, and El Paso, Texas. Seattle and San Diego through the central portion of the three western States. The United States System of Highways map showing the AASHO-approved U.S. numbered highways as red lines. The map, at approximately 50 inches by 32 inches, is the type of map highway officials framed for display in their offices. Because the President envisioned intercity routes that did not go into cities, his toll superhighways ended before the terminal points. For example, the line to Boston ended near Springfield, Massachusetts; the line to New Orleans ended near Port Allen, Louisiana; and the line approaching Washington ended in a junction with the north-south route in Virginia. The President asked MacDonald to study the feasibility of constructing toll superhighways in these corridors. The study also was to evaluate the feasibility of excess condemnation of more-than-needed right-of-way that could be sold or rented. Because the White House did not announce that the President had requested the study, the press focused on the Bulkley plan. MacDonald sent BPR's report to the White House on April 17, 1938. It concluded, first, that likely traffic on a toll superhighway network would not generate enough revenue to retire construction bonds. Second, the goal of a national highway system should be to modernize existing highways in rural districts and provide new routes to relieve congestion in metropolitan areas. Finally, while sale or rental of excess right-of-way could help liquidate the original investment costs, most States lacked the statutory authority to acquire the land; a Federal Land Authority with the appropriate authority would be needed. Although the report was not made public, it did not go unnoticed. Congress, having heard of the study, included Section 13 in the Federal-aid Highway Act of 1938 requesting a similar report on a limited toll superhighway network. The resulting report, Toll Roads and Free Roads (1939), concluded that traffic volumes would not be sufficient to finance most of the toll superhighways, but the country needed a network of toll-free express highways. In 1941, President Roosevelt appointed a National Interregional Highways Committee to study the subject further. The committee's 1944 report, Interregional Highways, prompted Congress to include a provision in the Federal-aid Highway Act of 1944 directing the Public Roads Administration (PRA), as BPR was called in the 1940s, to work with State highway officials to designate a 40,000 mile "National System of Interstate Highways." On August 2, 1947, PRA and its parent organization, the Federal Works Agency, announced the designation of 37,681 miles of the Nation's principal highways, including 2,882 miles carrying the rural routes through urban areas. Designation of urban networks of circumferentials and spurs would follow in September, 1955, to bring the total to the statutory 40,000 miles. By then, President Dwight D. Eisenhower had launched his campaign to improve the Nation's roads that resulted in the Federal-aid Highway Act of 1956. His signing of the legislation on June 29, 1956, launched what is now officially named the Dwight D. Eisenhower National System of Interstate and Defense Highways. That landmark signing occurred on President Eisenhower's last day in Walter Reed Army Medical Center following surgery. He was given a pile of bills to sign in the morning and another in the afternoon. He signed them without fanfare, a crowd of happy members of Congress, a signing statement, or a photographer â€“ he was probably wearing his hospital clothes â€“ which is why no photograph was taken of the signing. Press secretary James C. Hagerty told reporters that the President "was highly pleased" about signing the bill. It had been almost 18 years since the moment in time when President Roosevelt handed MacDonald that map. However, that meeting on February 2, 1938, was the unofficial start of the Interstate System because it triggered the steps that resulted in its construction. As for the map that changed hands that day, BPR eventually sent it to the National Archives and Records Administration. The map is included among the Cartographic Records of the National Archives in College Park, Maryland (Record Group 30, Series 10, filed as "Roosevelt Map").